An Aravali village walk | Souvenir. A simple early morning village walk in the Aravali’s can change your life. If you allow it. Around 7am we found ourselves making our way through mustard fields with women already stooping low amongst the crops, the herd boys with their flocks jingling past, the steaming breath of water buffalo in a paddy and the carefree chitter of schoolgirls wending their way along the path. We made our way through hamlets and fields and the warm smiles and greetings of passing locals and found ourselves invited in by a local family who kindly offered us breakfast. So gracious and warm we couldn’t refuse. An old sadhu was madly evoking the gods and a water buffalo bellowed back in response. We went inside the simple, clean home and the lady of the house sifted through corn meal that she had grown and dried. She proceeded to make chapattis with warm water and maize meal. They were delicious and soft and she shaped them expertly and then cooked them on a very hot tawa. She had one of those amazing mud shaped cooking stoves, neatly moulded and spotless, which she had made herself. She was very gracious and so genuinely happy to have us in her modest home. She served us chapattis with goat curd and a green coloured curry made from all the “weeds” that grow between the crops. 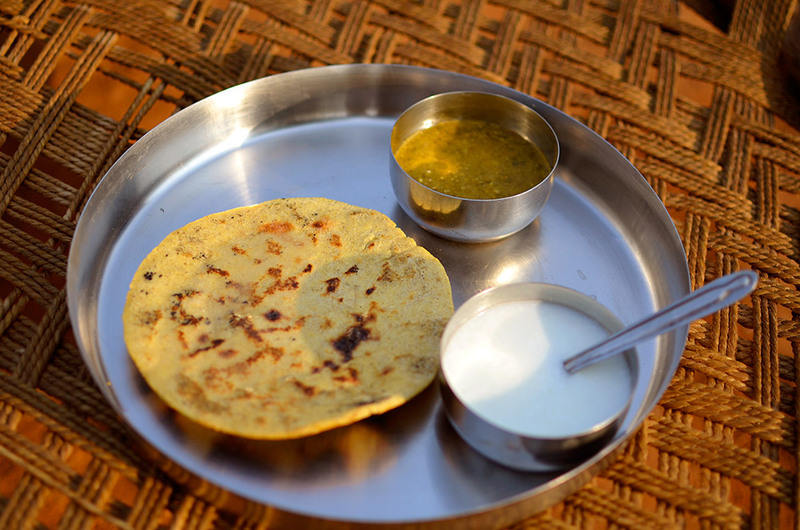 Also the chapattis are not always maize as they alternate between maize and millet and pearl barley, depending on the season and the crops available. In winter they eat late breakfasts then supper – two meals a day, and in summer one meal early before the heat, then a late lunch and then supper – three times a day. What a stroll, what an education!